A little bit of an indulgent treat tonight. This is a beautiful, delicate, creamy tart with soft leeks and dainty crab – mmm! 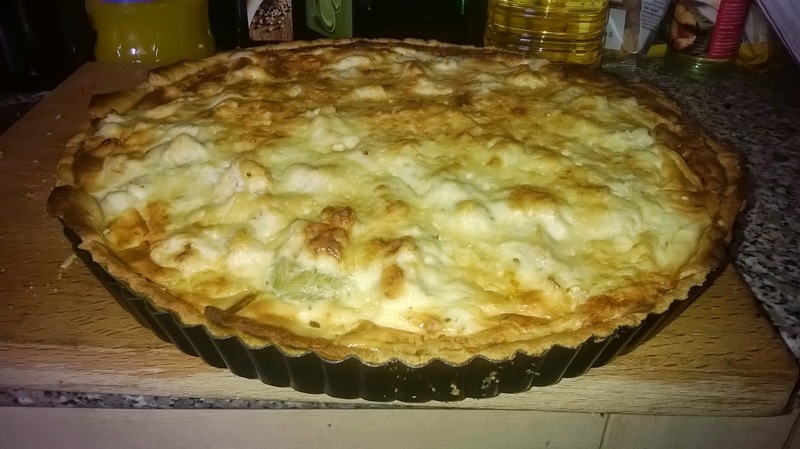 I’ve used half fat creme fraiche to make the filling rather than cream, as you’d usually use in a quiche, just because I think the tartness goes well with the crab and it’s also less calorific, so you can eat more! 1. To make your pastry, rub the flour and butter together with your fingertips in a large bowl until it resembles breadcrumbs. Then gradually add a little water, splash by splash, until it works together into a dough. 2. Roll the pastry out and lay it in a 25cm loose-based tart tin. Push the pastry into the edges and make sure there is an overhang over the edges, as it will shrink a little. Place a sheet of baking parchment over the top and fill with baking beans, then put in the oven for 20 minutes at 170 degrees. Remove the parchment and beads and cook for another five minutes, then remove the pastry from the oven. 3. Slice the leeks and saute them in a saucepan with the olive oil for 3-4 minutes. 4. In a bowl, beat the eggs, stir in the creme fraiche and oregano then season with salt and pepper. 5. To compile the tart, tip the leeks into the pastry case and smooth into an even layer, then layer the crab meat over the top. Evenly drizzle over the sauce, and then top with the cheese. 6. Bake in the oven for 25 minutes until golden, then leave to cool for 15 minutes before removing from the tin. Perfect served with a rocket salad!